Pink’s Hot Dogs, Inc., a 77-year-old landmark hot dog stand located in Hollywood, serves over 2000 hot dogs and 200 hamburgers a day. Pink’s was started in 1939 by Paul and Betty Pink, with a pushcart they purchased for $50, which money they borrowed from Betty’s mother. The land on which the pushcart stood was leased by Paul and Betty for $15 per month. Hot dogs at that time were 10 cents and cokes were a nickel. The menu was simple: A chili dog and a hamburger. Paul and Betty operated the hot dog stand, starting with 4 employees and expanding over time to 10 and 20 and now Pink’s has a staff of about 30 employees. In 1985, Paul and Betty retired. At that point, Richard, his wife, Gloria, and sister, Beverly, took over the operation of Pink’s. Since that time, the family has created over 35 combinations of hot dogs and a dozen varieties of hamburgers to satisfy the variety of tastes of its patrons. Due to Pink’s unique menu, its historic age for an LA restaurant (77 years) and its celebrity patrons, it is now a household name around the world. 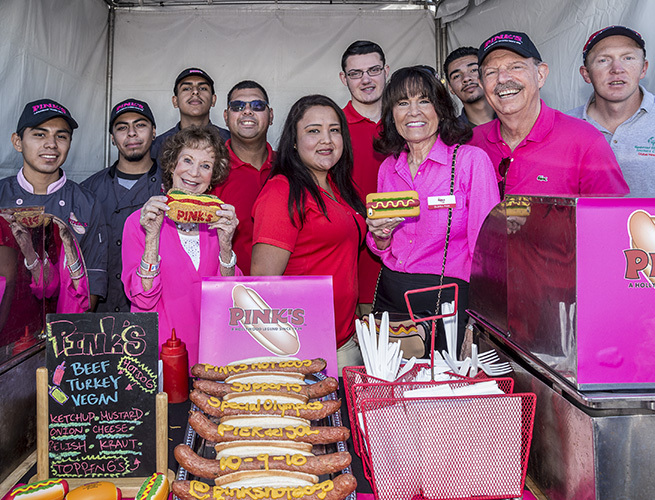 Pink’s Hot Dogs has been an avid supporter of Pier del Sol for more than eighteen years! We are excited to honor and celebrate their support and friendship of our Special Olympics Southern California athletes and of our movement.